Kuala Lumpur, 29 October 2018 – The glorious festival of lights is always paired with colourful decorations, including intricate Kolams. 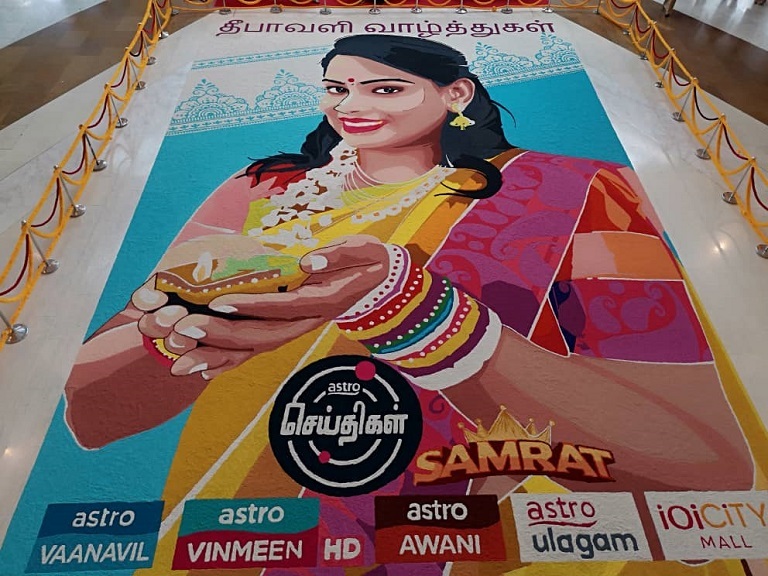 In conjunction with Deepavali celebrations this year, Astro Seithigal has broken the record of the largest Kolam made in Malaysia and received the record for the “Biggest Portrait Art Made of Multi Colored Grains” from the Malaysia Book of Records. A representative from Malaysia Book of Records presented the award certificate to Dr. Rajamani Chellamuthu, Senior Vice President, Indian Customer Business, Astro today. This design of this record-breaking kolam features a lady holding a lit Indian oil lamp and will be on display to everyone at IOI City Mall, Putrajaya from 29 October till 2 November. This work of art measures 1600 square feet and took 10 hours to complete by a total of 23 people, a mix of volunteers and the Astro Seithigal team. At the same event today, Astro announced the upcoming release of a 1-hour documentary on Tun Dr. Mahathir Mohamad titled “MAHA Sarithiram”. This documentary will feature the life of our current Prime Minister and his journey as a family man and politician, which culminates with his determination in winning the elections to make a comeback as Malaysia’s 7th Prime Minister. “MAHA Sarithiram” will be produced in Tamil and dubbed into three languages, Malay, English, and Chinese, and will premiere on Astro in January 2019. We are making this Deepavali extra special with our brand new site #NammaDeepavali. Catch Deepavali recipes, exclusive artist interviews and other Deepavali related content at http://www.astroulagam.com.my/NammaDeepavali!